I love this “dog,” if indeed that’s what it is… I love the idea of this creature, a barely mammalian, tiger-striped, sighthound-shaped hybrid that is as wild as its coat pattern and alien face. 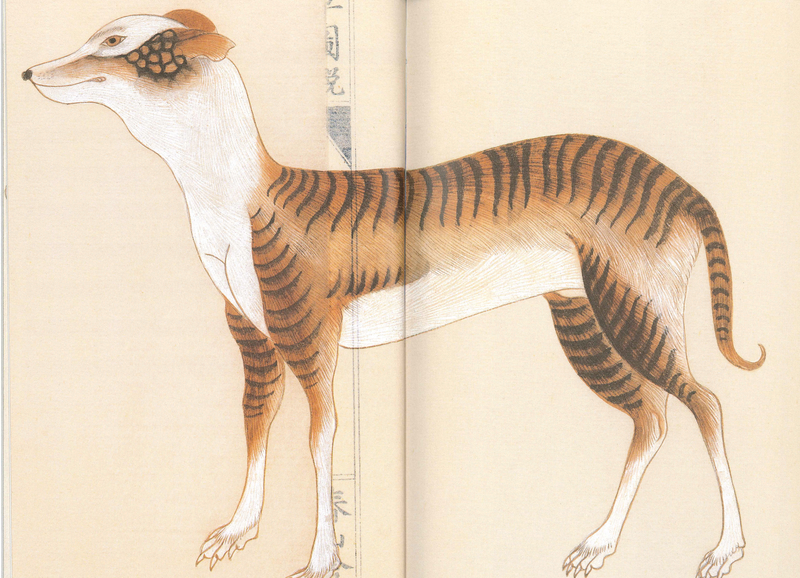 However, I need to do a little more research to figure out if this illustration was supposed to document a real canid that existed around the time of its artist, TAKAGI Shunzan 高木春山 (b. ? ~ d. 1852), or if was a record of his imagination. The drawing originally came from a 195 volume encyclopedia of flora and fauna, the Honzō zusetsu 本草図説. I scanned this particular illustration from The Graphics of Japanese Dog [Nihon no inu 日本の犬], ed. TAKAOKA Kazuya 高岡一弥 with photographs by KURU Sachiko 久留幸子 (Tokyo: Pie Books, 2005).